When it comes to the changes and phases of your body, you are the first line of defense in noticing if there are any unusual changes. This puts you in the best position to discover any differences that might indicate the early onset of illnesses. This is especially true for oral cancer. It is often painless but very visible and, since you brush your teeth (and look at your mouth) daily, you will be the one to notice any changes to your tongue, lips, cheeks, or any sign of discoloration around your mouth. So what should you look for when self-examining for indications of oral cancer? Below are five areas that you should pay attention to, and the signs to look out for. Your lips are the most visible part of your mouth. They are also the most sensitive to exposure. 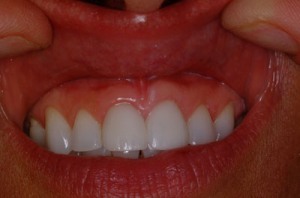 Examine both the inner and outer lip for any changes in color or texture. (Differentiate between dry lips, or bite marks and alarming changes to your lips). If there are discolorations that persist--and they are coupled with other changes on and in your mouth--you will want to get them checked. Besides your lips, your cheeks are the second most visible area. Gently touch your cheeks, examining any signs of white, red or dark-colored patches. Also, examine for lumps or any kind of swelling by putting your finger on the inside of your cheek and making circles to detect any bumps or irregularities. Look for any protrusions on your face. If you look straight into the mirror, you will be able to notice any inconsistencies in your face, especially if one side is more swollen, than the other. Pay attention to your neck and, using your fingers, feel for any lumps on the sides and front of your neck. This is where you might also notice some tenderness or if there is any soreness and swelling. When you are in front of the mirror, stick your tongue out and examine the upper surface of your tongue. You should look for any unusual lumps or obvious changes in color. Stretching your tongue out even further, look out for any dark blotches; examine the sides of your mouth for any lumps, masses and any discoloration. Repeat the same procedure for the bottom part of the tongue, paying attention to the floor of your mouth. Tilt your head back and examine the roof or your mouth; if you have a hand mirror that will fit inside your mouth, so much the better. You will also need to use your fingers to feel for any protrusions. Visually examine any changes in color. This list above is limited to the essential procedures, but it should offer the earliest indication that you need to go see your dentist for a thorough check-up. Make a habit of this routine, and perform your self-examination as often as possible; it's not difficult, and takes very little time. As the saying goes: it's better to be safe than sorry!